One last thing about Boquillas: there is no cell phone service. Zip. Zero. Nada. To my surprise, while we were waiting on breakfast an older gringo man appeared. His name was George and he is a Terlingua resident that volunteers his time installing solar panels in Boquillas. It is the only source of electricity for some here in Boquillas so George is well known and liked. The restaurant owner called out a happy “good morning George” when he arrived. George owns a Yamaha WR250R and when he spotted our bikes he felt compelled to say hello. We had a pleasant visit with George, discussing bikes, riding, and this part of Texas. George is also a musician and part of a well-known local band called Los Pinche Gringos. After breakfast I gave Raul some money for his assistance and then we started putting our gear on. It was time to ride. A word about our route: When we initially starting planning this ride I knew that, barring any major problems, it would only take two days to ride from Acuna to Ojinaga. However we had three riding days available. What should we do with that extra day? 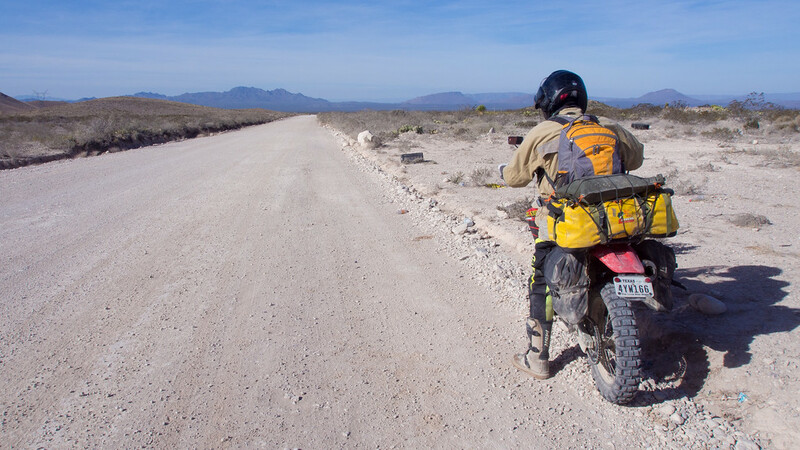 We could have taken the two day ride across Mexico and then spent our third day riding in the Terlingua area. Or we could spend an extra day in Mexico. JT and I have both ridden the Big Bend area a lot so an additional riding day in Mexico seemed like a fine idea. One of the cool things about the E32 map is that the guys who make it color code particularly note worthy dirt roads. They highlight these special roads in magenta to make them really noticeable. My experience has been that those magenta colored dirt roads are actually worth seeking out. 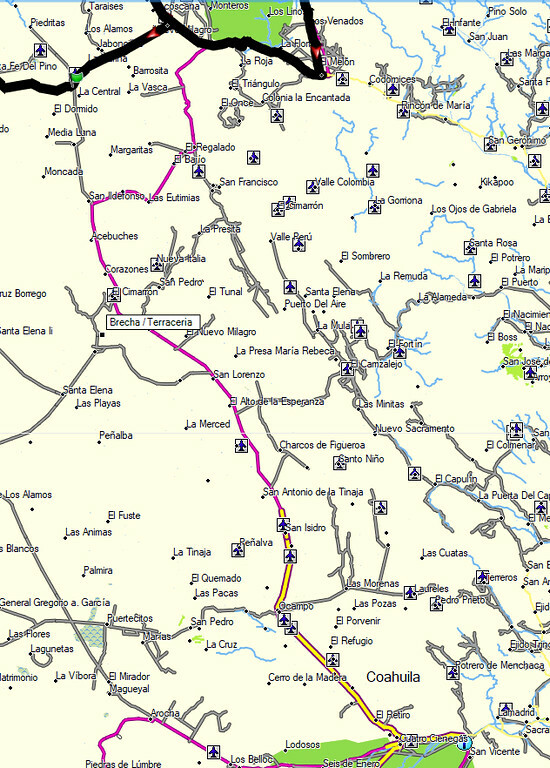 For example, the dirt roads around Galeana, where the annual MexTrek rally occurs, are fantastic and they are all highlighted in magenta. Well, the E32 had a long magenta colored road in this area. 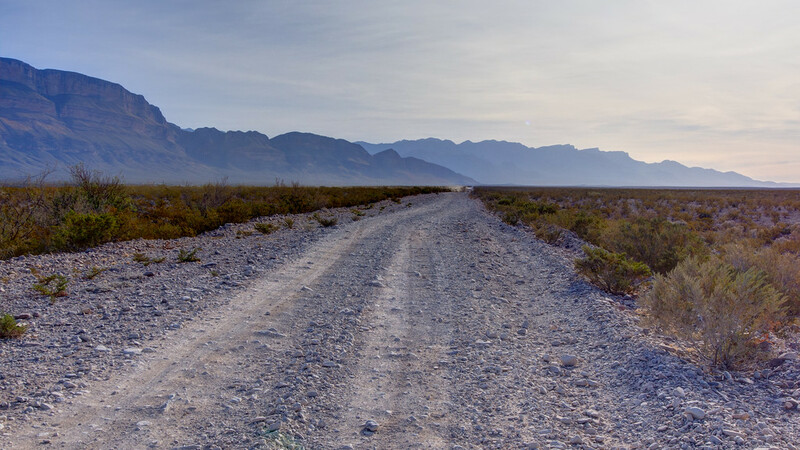 Its northern end started at the paved road running between Boquillas and Muzquiz and its southern end was the town of Ocampo, about 175 miles away. JT and I discussed it and decided it was worth checking out. Our planned route was to run down to Ocampo and stay the night. The next day we would backtrack north and then catch the track west to Ojinaga. It seemed like a good plan. We would get a third day of riding in Mexico and get to check out a new magenta road –and, after all, the other magenta roads we had ridden were truly gems worth exploring. You can see the road on the map below. Except in this case, it wasn’t worth exploring. As it turned out, this is the road that they use for the Coahuila 1000. We speculated that the race organizers needed the course to pass by Pemex gas stations ever so often and the one in Ocampo was the closest one accessible via a dirt road. So the road wasn’t picked by the Coahuila 1000 due to it being an exceptional dirt road – it was picked for convenience only. A fact JT and I were blissfully unaware as we started our day. In any case, after waving goodbye to Boquillas, we headed south, backtracking from the day before. I remembered to take a picture of the road this time. Upon reaching the magenta road, we discovered it was a gravel super highway. A really long, straight superhighway. There was nothing special about this road but at least we could make good time. Unfortunately, things went downhill from here. After about 50 miles of gravel superhighway riding, the road deteriorated badly. The main industry in this area is mining and the big mining trucks are tearing the **** out of this road. It was the worst washboarded road I’ve ever been on. I thought it was going to beat my Husky to death and kill my Garmin Montana with vibrations. It was terrible. There was no speed at which you could ride to smooth things out. The faster you went the more your bike vibrated. And the road went on, and on, and on like that dang energizer bunny. 30 miles. 40 miles. 50 miles. Is this terrible road ever going to end? I thought the washboard ripples were bad until we started catching the big mining trucks. Remember, this is the desert, so there is sand dust everywhere. The big trucks were kicking up dust clouds so thick you couldn’t see through them and, therefore, had no idea if any vehicles were coming from the other direction. The trucks would see us approaching from behind and would pull over to the right to allow room for us to pass. Unfortunately, we couldn’t see if there were any on-coming vehicles so we had no idea if it was safe to pass. Our only two options were to either ride behind the trucks, which were moving at 10-15 mph, or pass and hope we weren’t killed in a head-on collision with an unseen vehicle. We opted to pass. Each time we did so, it was an incredible pucker moment. One I would prefer never to repeat. Finally, after eternity passed, we reached pavement. It is the yellow colored, magenta lined part of the road in the map above. If you are thinking, “Great, the guys are back on pavement. Everything is good now.”, you are wrong. Unbelievable but true, the pavement was actually worse than the washboard road. No kidding. The pavement was so potholed and torn up it was impossible to miss all the holes and the pounding on our bikes increased 3x while our speed dropped by a factor of 2. When a dirt road gets a pothole, the edges of the pothole are relatively smooth. When a paved road gets a pothole, the edge of the hole is a sharp edged, tire eating, rim bending monster just waiting to destroy you. The paved road was so bad that even the locals don’t want to drive on it. They have made an impromptu dirt road by riding in the ditch alongside the dirt road. Since this dirt road was created by cars & trucks and not a road grader, it’s just about as bad as the paved road with the extra advantage of the holes and ruts being camouflaged under a deep coating of dust. I couldn’t decide which was worse so I alternated between riding the paved road and the dirt road. I would ride along for a mile or two on the paved road, curse loudly in my helmet, then jump off the pavement onto the dirt road. I would ride the dirt until I finally got tired of hitting hidden holes so big they threatened to crash me and would then jump back on pavement. Finally, when despair and desperation seemed to be taking over my psyche, we reached the town of Ocampo. We stopped at a Pemex and JT looked at me and said “to **** with that road, I ain’t riding it again tomorrow”. It was a sentiment I completed agreed with.